Last month, I noticed that my United Airlines miles were about to expire. You have to fly with them once every year and a half to keep your miles current. 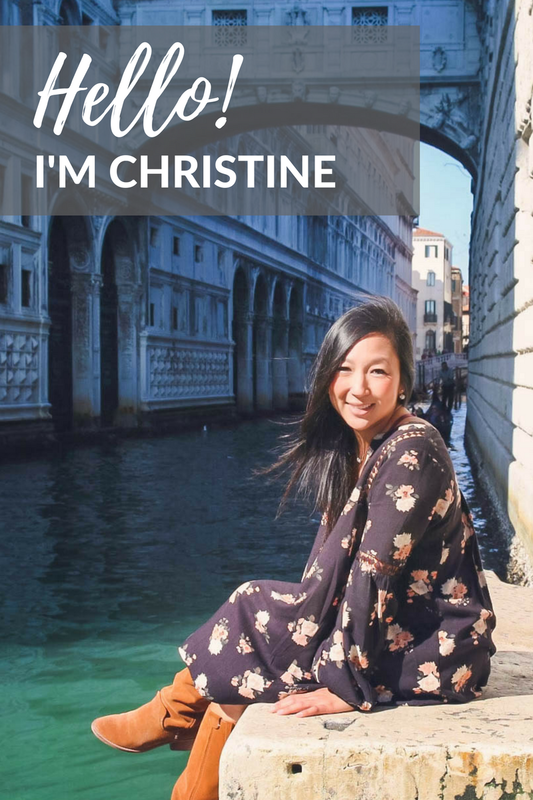 Within the last year and a half, we flew to Europe twice and to multiple destinations within the United States... but none with United (let's be honest, they are rarely the cheapest option and their customer service has been spotty at best). So I went on their website and started searching possible long weekend trips we could take before September. Tampa had really cheap tickets but it wasn't manatee viewing season. New York City, Los Angeles and Chicago all had decent airfare but we wanted to visit someplace new. Then I saw Calgary. 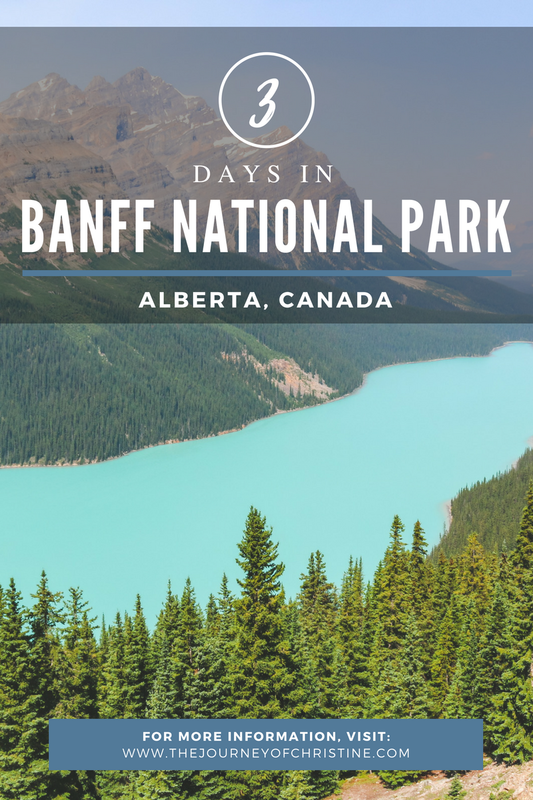 I knew Banff was nearby and I have always wanted to visit that National Park so after confirming with Lyndon, we booked our tickets to Canada! Booking a last minute trip to a pretty popular summer destination was maybe not the smartest. We had our airfare but finding a hotel room that wasn't $500/night was damn near impossible. And of course, famous hotels like the Fairmont Chateau Lake Louise and Fairmont Banff Springs were completely booked as well... cause if I'm going to spend $700/night, it better be at the Fairmont. So after widening my search, I found a pretty nice Marriott outside of the national park. I wasn't thrilled about the location, it was an hour drive to the town of Banff (and even more to all the popular lakes and hikes), but hey a room's a room. 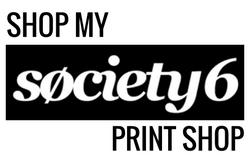 You know that feeling where you're not completely happy, and you feel like you're settling? While I was super excited to finally go to Banff National Park, our hotel left me feeling eh. So a week out from our trip (and thankfully still within the Marriott cancellation policy), I did another search. I mean people cancel all the time right? Hallelujah, a hotel in Banff had opened up and I quickly booked it without thinking twice. Everything was coming together... except for the whole wildfire part. 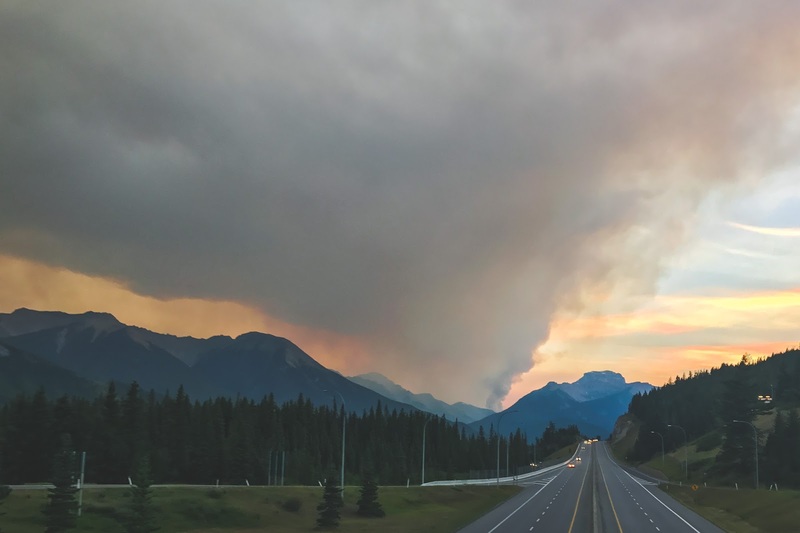 I knew that the southern part of Alberta and British Columbia were getting hit pretty hard by wildfires but I didn't realize how close to Banff the fires actually were. When we arrived in Calgary and drove to the national park, I didn't notice any smoke and I had actually forgot about the fires. The next day, we woke up early and went hiking until about mid afternoon and to me, it seemed clear all day. It wasn't until that evening when we drove to center of town to ride the Banff Gondola did we notice this thick haze. You could literally see ash floating around in the air. It was pretty windy that evening too so I'm sure that made things worse and probably blew the smoke over to Banff from the British Columbia/Alberta border. Banff definitely had it the worse (while we were there). When we drove north towards Lake Louise, it definitely was not as smokey and cleared up a lot. But after going through my photographs, I noticed that some places north of Banff had a haze to it. I guess I didn't notice it with all the sunshine but my camera definitely picked it up. Oh well, nature happens. Banff National Park is still out of this world gorgeous and one of the most beautiful places in the world. We had an amazing long weekend there and I would 100% go back someday... and maybe go in the fall or spring and see some snow (which we never get in Houston). When I told my friends and coworkers that we were heading to Canada soon, they all gave me that "Canada?" look. I guess Canada isn't as flashy as Japan or Italy but trust me, Banff National Park is one of the prettiest places I have ever visited. So how we did we spend our 3 days in the Canadian Rockies? Here is a quick rundown of our trip to Alberta. We arrived shortly after noon on Friday and left Monday around the same time but since we had to arrive at the airport early, Monday was purely a travel day for us. I will be posting more about each of these lakes and hikes in the coming weeks so if something below catches your eye, don't worry a detailed post is coming your way. 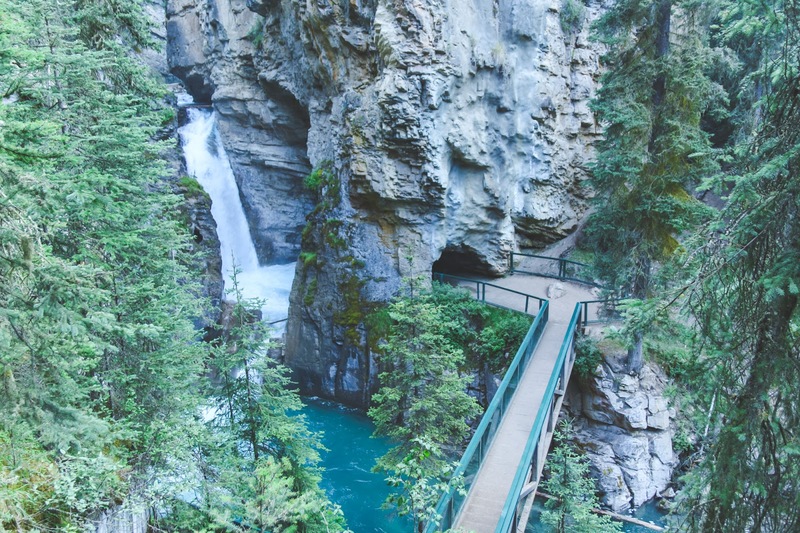 While technically this isn't in the national park, it is still a great stop on the way to or from Banff National Park. It is conveniently located between Banff and the airport in Calgary. You can read more about our stop at this cool sanctuary here. Got kids? 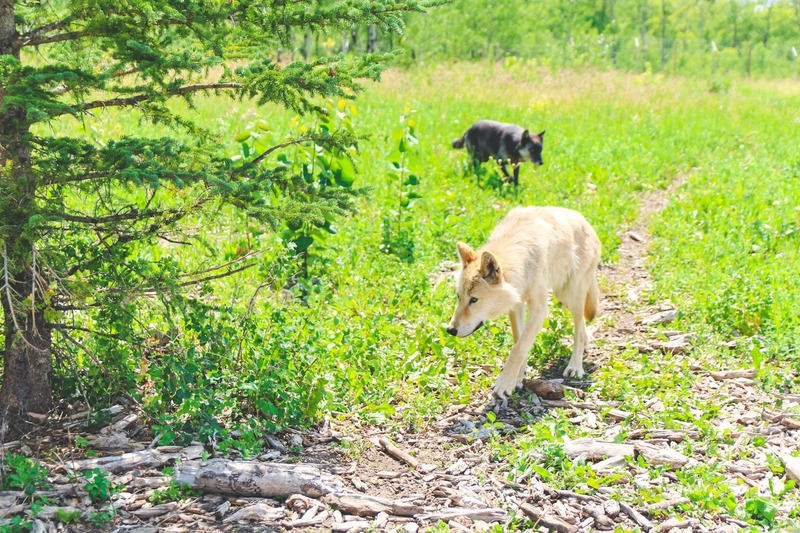 I think they would really enjoy seeing and learning about the wolfdogs. While they have to be at least 12 years old for the Intro Tour and at least 15 years old for the Interactive Tour, it is still a fun place for all ages. This hike is pretty special. It consists of two falls, Lower Falls and Upper Falls. The hike is fairly easy but walking on the constructed walkways that are built onto the sheer canyon walls can be a little frightening. In between Lower and Upper Falls, there is this "secret cave" and after seeing it on Instagram, I knew I had to see it for myself. I read many posts and reviews but directions to this cave were all so vague. After taking a wrong turn cause one person said to turn right after Lower Falls (which is not correct) we made our way back to the main trail and eventually found the "secret cave". 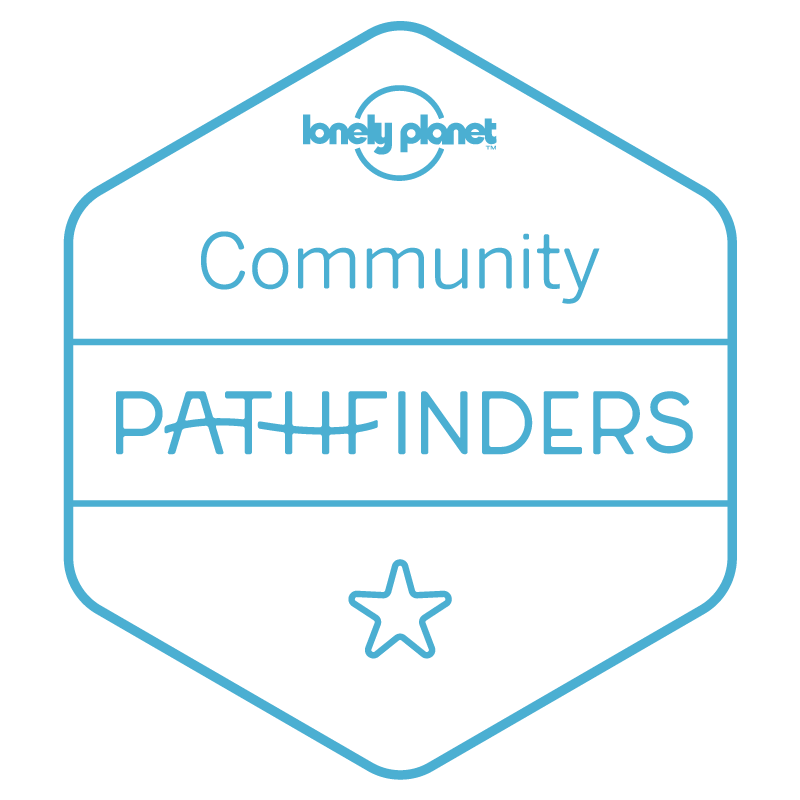 When I post about this hike, I will definitely include super detailed directions and pictures! I mean look at this water! 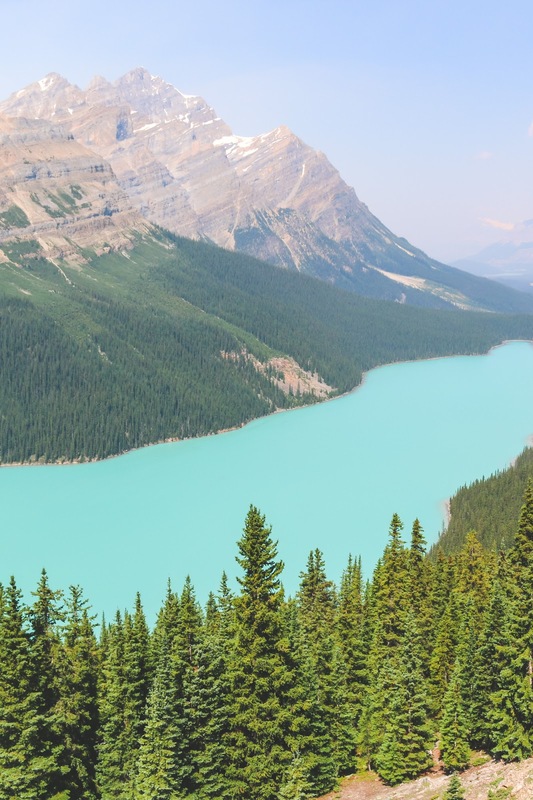 Peyto Lake is gorgeous and the hike is super fun especially when you hike past the massive crowds at the viewing deck to get to this amazing view (I'll go into more detail when I post about this hike). As you can see, this lake has a really pretty turquoise color to it. It's due to the glacial rock flour that flows into the lake during the summer months. 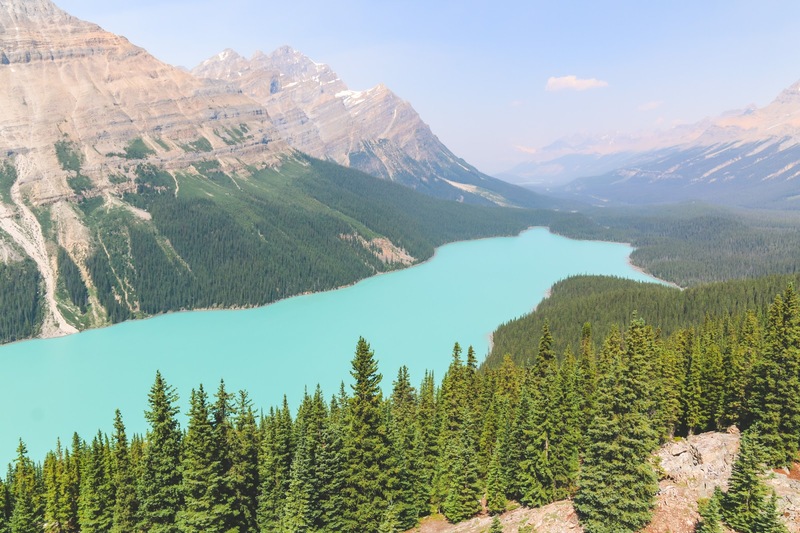 Peyto Lake sits a lot more north than Lake Louise and is about a 45 minute drive from there (and about an 1 hour 15 minutes drive from Banff) so because of that, it's not as crowded. But don't let that fool you, we still had to park a ways down the road from the trailhead. Before our trip, Lyndon was adamant on going swimming at one of the lakes in the national park. I told him that all the lakes would be freezing and it would be like swimming in a tub of melted ice. Even though I'm the Aquarius in the relationship, he's definitely the water baby and said that it wouldn't bother him. After our hike at Peyto Lake, we stopped at Bow Lake so the boys could cool off. I gotta give it to Aiden and Lyndon, they stayed in that water longer than I thought they would. Even nearby sunbathers were impressed at how long they both stayed in the water. Bow Lake is filled with meltwater from Bow Glacier so you know it's cold. I purchased our gondola tickets about a week before our trip like a good planner but this time, planning ahead might not have been the best idea. As we drove into the center of Banff, we noticed this thick haze. It was obviously smoke from a nearby fire. I tried to stay positive but it was pretty clear the closer we got to the gondola parking lot that the smoke was just getting thicker and thicker the higher we drove. The parking lot was only half full and there was no line to get on a gondola but we were determined to make the most of it. I have a pretty big fear of heights so the ride up and down had me sweating (and freaking out on the inside), but Lyndon did a great job calming me down and holding my clammy hands. Moraine Lake sits very close to Lake Louise (you take the same exit for both lakes) and to me, Moraine Lake is the prettier lake of the two. 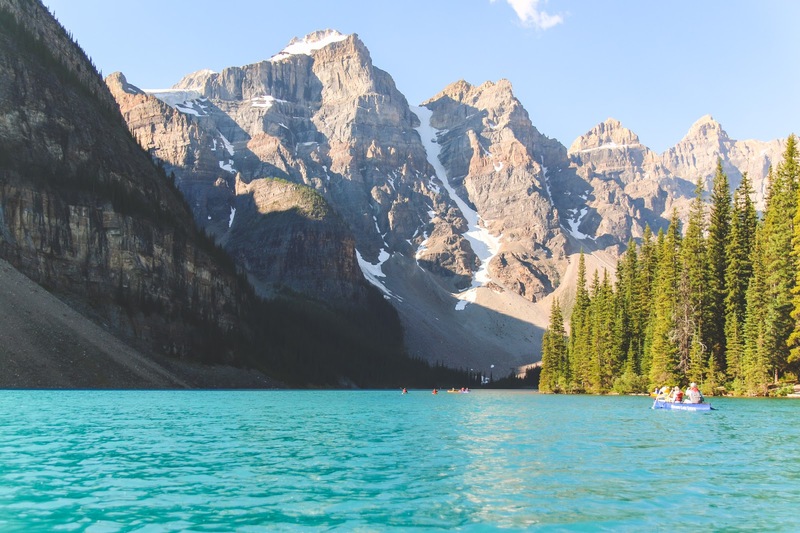 I guess that's not fair to say since we opted to skip Lake Louise this trip but after looking at pictures online and on Instagram, I opted that we head to Moraine Lake first and if we had time and energy, we could head over to Lake Louise afterwards (which we didn't). Moraine Lake is small in size but sits in the Valley of the Ten Peaks which makes it one of the most scenic lakes in Banff National Park. 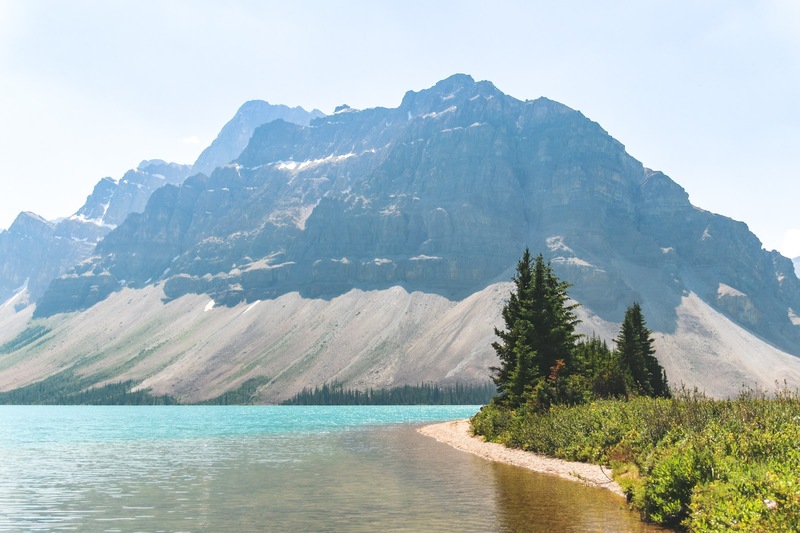 Like a lot of lakes in the national park, it is glacially fed which means the water is ice cold like Bow Lake. One of the touristy thing you can do at Moraine Lake is go canoeing. We rented a 3-seater and spent an hour on the blue water and it was worth the $90.00 Canadian dollars. After our packed Day 2 and our morning at Moraine Lake, we were pretty beat. We decided to skip Lake Louise all together (plus a handful of people told us that after Moraine Lake, Lake Louise won't seem that impressive) and decided to head back to Banff to have lunch. After grabbing lunch in town, we decided to walk to Bow Falls. Bow Falls is a waterfall on the Bow River. 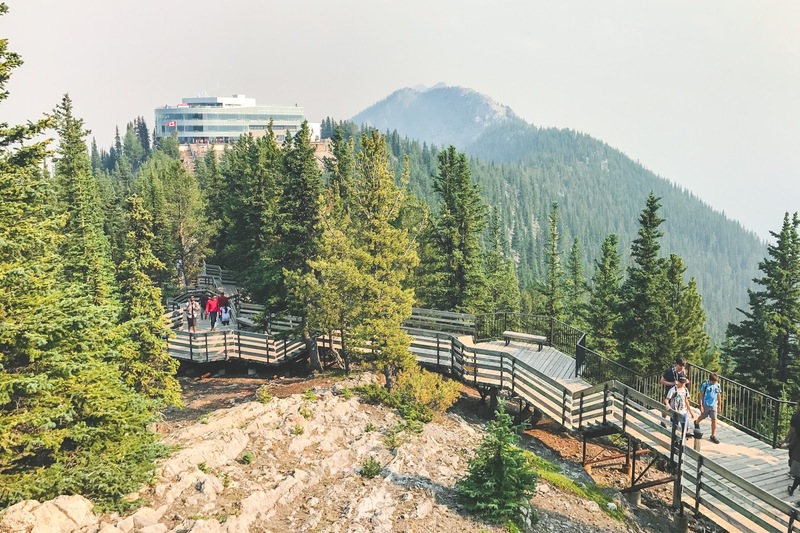 It is walking distance from town and sits next to the Fairmont Banff Springs Hotel. While it is a major waterfall on the river, it is pretty small in size. The trail has plenty of shade and at the bottom of the fall, there is some seating so it's a nice way to spend a lazy afternoon. So during the trip, we didn't really see any wildlife. I mean seeing a bear would have been scary but cool or seeing a ram would have been awesome, but we didn't even see an elk. The only wildlife we saw were some chipmunks and a goat at the top of the Banff Gondola. So after Bow Falls, we headed back to our hotel and hung out until sundown... when animals head out to grab some grub. 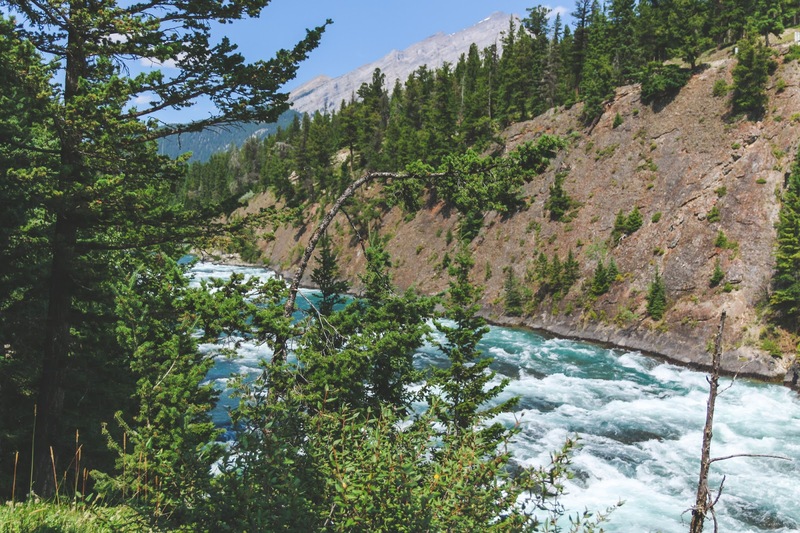 I did some online reading while at the hotel and many people said that they saw a lot of wildlife on Lake Minnewanka Scenic Drive so Lake Minnewanka Scenic Drive we went. It was later in the evening, so there were barely any cars on the road (which was nice). The second we turned onto the road, we saw a field with a couple of deer grazing away. This was a good start. But then our luck ended. On the way out (the road makes a circle), we passed by the same field and a couple more deer joined the group. Oh well. But on the way back to our hotel, we noticed a fire not that far away from us. The smoke filled the sky and covered what have been a really pretty sunset.